Базухаир М. А. Head-mounted display for In-Flight Entertaiment systems // Молодой ученый.  2015.  №14.  С. 126-128.  URL https://moluch.ru/archive/94/21199/ (дата обращения: 19.04.2019). Optical head-mounted displays (OHMDs) as augmented reality devices increasingly find applications in aviation industries. Being limited to simulation and training programs, OHMDs are still away from extracting sufficiently their promising potentials, especially concerning In-Flight Entertainment (IFE) experience improvement and passenger luxury enhancement. This paper outlines basic technical requirements for OHMDs, installable on future IFE passenger cabins. Application of head-up displays (HUDs) for fighter jet and helicopter cockpits in 1970s put the first steps for augmented reality devices to be effectively implemented in aerial vehicles. Later, helmet-mounted displays (HMDs), with a small display optic in front of one (monocular HMD) or each eye (binocular HMD), were developed to be worn on the head of pilots, providing them with key navigation data and high targeting capabilities, especially during night close combats . HUDs have been introduced to commercial aircraft cockpit. Many aviation corporations and companies included HUDs into their cockpit instrument panels, e.g. B787 and A380 [2, 3]. For example, the conformal HUD secondary system of A380 presents essential flight information and guidance to the pilot in his forward field of view for all flight phases. It is a see-through device accurately, displaying collimated flying symbols overlaying the real outside world view . Optical head-mounted displays (OHMDs) as wearable devices became the next generation of HMDs. In aviation, their early application was limited to flight and combat simulation within training programs. This technology allows virtually placing a trainee in a situation that is either too expensive or too dangerous to replicate in real-life . Recently, new prototypes of unmanned flying vehicles (UAV) such as drones and quadcopters, mounted with video cameras and driven by First Person View (FPV) systems have been developed. Basically, they use, as an example, a platform of Moverio BT-200 wearable glasses and a sufficient operative system, where real-time quadcopter cockpit view with all the telemetry in flight can be remotely projected to ground operator . 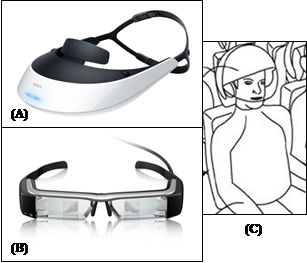 However, neither current conceptual projects nor already demonstrated prototypes propose effective integration of HMDs with aircraft passenger cabin in-flight entertainment (IFE) systems until the end of 2014. Since, a filed patent from Airbus Operations Sector inventor, firstly, revealed innovative solution, which combines HMD advantages as luxury and option abundance with IFE options. A passenger seat headrest supplied with helmet that partially houses the head of passenger, while being attached to fixed carrier . Further, the entertaining content is displayed to the passenger by a transparent movable display at eye level. The passenger, i.e. user inputs his commands by widespread joystick tool, or optionally by a projected laser keyboard on seatback meal desk. In this paper we suggest a heuristic methodology based on meeting definite technical requirements for prospective wearable IFE systems to be considered by their developers through inventing process. Optimization of wearable IFE performance is associated with technology progress trends so as to make final products sustainable and viable even after many years next. Therefore, main focus is paid to the following key features, which need thorough conformity according to available manufacture and production technologies, no matter wither being already tested or not related yet to aviation fields. 1) Weight reduction. Whereas IFE specialized for entertaining, they must result the lowest, feasibly achieved, load effect on aircraft total weight ratio. Integration of OHMDs with new IFE systems will significantly reduce their weight by the half. Furthermore, it is expected to continue such tempo as nanotechnology market promises to shrink contentiously eyewear displays to the size of an eye pupil. In this context, analysis of Airbus proposal, showed in Figure 1 (C), remarkably lacks to meet the descriebed herein requirement, even though smaller OHMDs have been available so long prior to patent application date, beginning from 1995 . This result caused by the inventor preferance to use well tested technology rather than a newly developed one. Comprehensive analysis of such a new technology promising features by professional experts is able to envision their prospects as in the case of OHMDs. The long time periods between aircraft ducumentation and production phases are a key factor of the highlighted problem. 2) Security enhancement. Wide feel of IFE system high protection against meddlesome attacks and misuse lasted a long. Recently, it has undergone a hard shock after an American cybersecurity consultant got into flight control system up to 20 times during three years of his traveling, meanwhile diverting aircraft shortly from its given flight course . The hacker claimed connecting to aircraft systems through passenger seat electronics box using typical plug hardware, attachable to Panasonic and Thales IFE systems, which are installed on both Boeing and Airbus airliners. Such incident revealed many security gaps, represented in putting seat electronics box at easy to reach place, providing full accessibility of any unauthorized side. In fact, this could be the same problem for OHMDs if connecting wires and plugs remain naked to the hand of passengers. Thus, their design must have built-in plugs to neutralize hacker misuse and lessen their accessibility. 3) Low power consumption: modern IFE Power Supply Unit (PSU) consumes in minimum over than 300W . It means that for B747–400 maximum seating with 624 passengers , the total consumption increases to almost 187kW. In contrast, the implementation of OHMDs in IFE system is capable of reducing power consumption, since it uses more efficient mini-projectors and electronic circuits. 4) Mobility: one of the biggest disadvantages of current IFE displays is their limited angular range of watching. Passenger maintains a fixed neck and head position during long periods causing, in many cases, pains at those areas, exhaustion and boring. For international airliners that carry in the most foreign passengers, translated movies on-demand occupy the top of passenger favorite IFE services. Nevertheless, the relatively small dimensions of IFE screens with 15 inches diagonally make it hard to concentrate on tiny translated texts from seating distance, resulting aforementioned physical problems. This problem remarkably will worsen with use of Airbus newly patented headrest HMD. From this prospective, only OHMDs have the best concurrent features to overcome dimension restrictions with their very wide display feature up to 40 inches at 2.5 m from the virtual screen, e.g. Moverio BT-200 . Wearing OHMDs makes no restrictions for passenger motion in all directions, positions, providing one of major satisfaction requirements of each future passenger. 5) Interactivity: current IFE touch screens offer a single aspect of interactivity based on joystick for data input. However, current OHMDs are supported by light, motion and voice sensors, capable to give the passenger utmost entertainment. They provide the ability to interact with videogame characters using 3D display and facial motions, voice commands and etc., and even to have onboard medical care using pertaining sensors for temperature and blood circulation. All these minuscule sensors are attached to OHMDs frame and lenses, keeping wearable device total weight within limits. 6) Multiuse: is defined as the ability of IFE system to perform more than only entertainment services. For example, Thales IFE services can range from video and audio on-demand up to meal ordering, online phone calls and internet browsing, including Wi-Fi connectivity etc. Such features are supportable by OHMDs hardware and software. 7) Aesthetic design: future sophisticated passenger cabins are going to be designed according to aesthetic scenery that resurrects more psychological satisfaction. Current IFE proposals with HMDs would restrict passenger cabin interior designers as the headrest-fixed hamlets should be taken in regard. Such problem is avoidable with the use of small size OHMDs similar to Moverio BT-200, completely designable to be hidden inside armrest or backseat built-in carrier. Accordingly, we have shown the prospect of OHMDs implementation in IFE systems onboard future aircrafts. Mean conclusions are high competitiveness of OHMDs in terms of weight, power consumption, mobility and aesthetic designs towards currently widespread 2D touch screens. Future passenger cabins will be supplied with many sophisticated IFE systems, e.g. holographic and 3D screens, but OHMDs with augmented reality would be widely implemented. 1. Spitzer, Cary R., ed. «Digital Avionics Handbook». Head-Up Displays. Boca Raton, FL: CRC Press, 2001. 2. Norris, G.; Thomas, G.; Wagner, M. & Forbes Smith, C. (2005). Boeing 787 Dreamliner — Flying Redefined. Aerospace Technical Publications International. ISBN 0–9752341–2-9. Основные термины (генерируются автоматически): IFE, HMD, FPV, ALBERT, CNN, CRC, FBI, HUD, ISBN, PDF.